It's a good shift for our relationships. A full moon in Libra will be visible in the night sky on March 21st, towards the early hours. It is a full moon that takes place a little less than four hours after the Sun has entered into the zodiac sign of Aries, marking the time of the Spring Equinox and the beginning of a new year in astrology. It is also a full moon that takes place on the 0°09’ of the Aries–Libra axis, with the Sun that symbolizes our ego, our own self, on the very first degree of the zodiac. An ego that is ready to jump on anything new filled with a pioneering spirit. The timing of this full moon in Libra alludes to new beginnings or to the emergence of a new self. Full moons are times of heightened tension. They mark a period when a balance is sought between our will and our feelings, between the conscious self and the unconscious. Experience and objectivity on one hand, intuition and sentiments on the other, are symbolized in the polarity of the Sun and the Moon. A polarization that, as the full moon culminates, welcomes a realization out of its tension. So, under this full moon that concerns relationships, a seesaw moves between “Every you (Libra) and every me (Aries).” But at which side it shall stop? The answer lies in the chart. 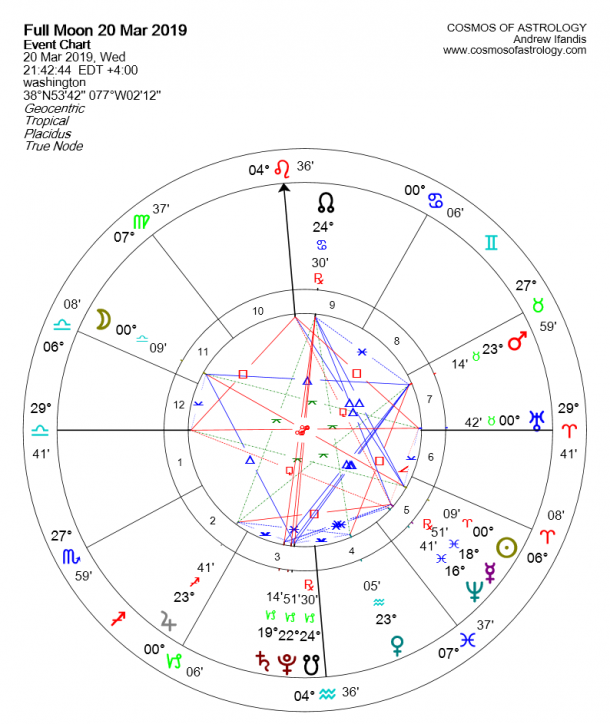 The opposition of the Sun and the Moon, as always, is a tension that will be revealing, but in the chart of this specific full moon in Libra, the ruling planets of the two Lights, Mars and Venus are in square aspect to one another. This aspect is highly charged sexuality, it is the warring principle in relationships, it is loving and hating and loving again. Mars, from the most reliable and steadfast sign of Taurus, desires to relate with a most independent, freedom-loving, and unpredictable Venus in Aquarius. But this is not easy. The aspect is tight, nearly partile. So this full moon brings a quarreling culmination between the male and the female. Not only the Mars and Venus sexually charged clash alludes to this, because if it was only this, then the fight could be easily resolved in the bedroom could be fine again the next day. Uranus in Taurus started on March the 6th to unsettle stability, and in this particular full moon, it is also making a quincunx aspect to the Moon. Charging with more tension the already tensed feelings, it will stir our desire for breaking away. This full moon seems to be a culmination that will be a make or break our relationships, with the odds being a little more in favor of breaking. As we have seen, it also marks a pivotal time for new and very important beginnings due to its critical cardinal quality. Is this the only verdict? Aren’t there any other harmonious aspects to help? Mercury is conjunct to Neptune in Pisces and retrograde, so our thoughts may linger on the past and a re-examination of a relationship will take place. Will we be inspired or idealized? Will be the re-visioning the past? No, neither of the two. Mercury is also in a square aspect to Jupiter and a sextile aspect to Saturn. The relationship will be revisited in its whole. We will make a mental stroll in its romance and compassion, and the moments of mutual understanding, but we shall also revisit its every detail and overthink it. Our thoughts, out of the abstract Piscean and inspired Neptunian energy, will distill the essence of the relation. The sextile of Mercury to Saturn will make us asses it clearly and in its entirety. And then, clarity will guide our actions, because Saturn is also making a nice trine to Mars. Though this full moon is a shift for our relationships, it marks a time that will be good for us. Since the change seems to be necessary, it will be done after consideration and thought, and it will be us who decide the when and the how.